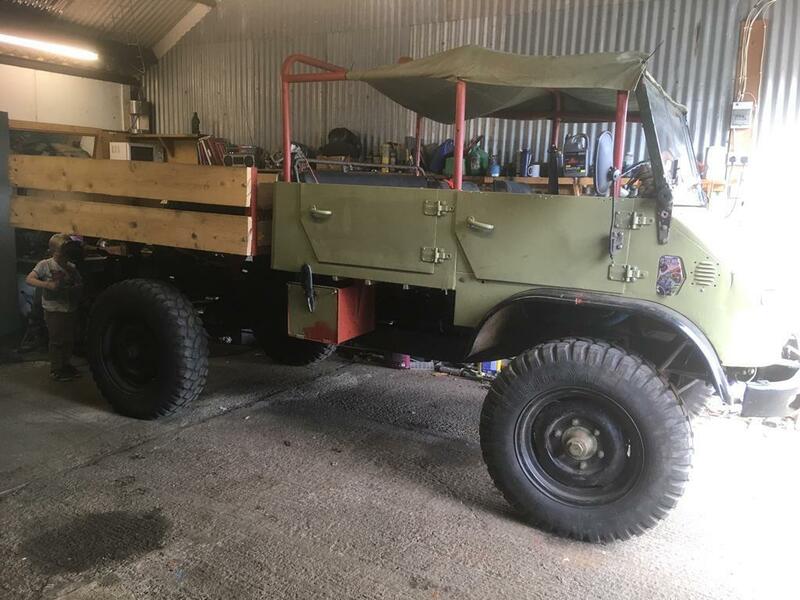 It is with a heavy heart, that I offer up for sale my Unimog 404.
started as a rusty 2 door, converted to 4 door DOKA using genuine Mercedes parts, and using a later 1964 cab. it has good tyres on it, converted to full LPG using 'gotpropane' system, so its totally dependent on LPG, it runs fantastically on this, has all of its 82HP, starts on the button. runs nice, will max out at 60MPH and run all day long. It truly is a very good running and driving Unimog. It has a 6 foot square bed on the back made from 50x25 RHS and scaffold boards, I've had two tonne in the back on it. I've owned it seven years - nearly eight, I was planning on keeping it and continuously working on it. Its a blast to drive round, people wave at you in delight. I have recently fitted a PTO to it, and acquired a PTO driven winch to mount on the front or back, If I get what I am asking I will include these in the sale, If I don't get what I want for it (the asking price), the gearbox plate will be re fitted and the PTO and winch removed for a separate sale. - these are rare to find item for a 404. It will come with a large amount of spares, including brand new XZL tyre with a spare rim, engine spares, odds and sods I've collected over the years, service items, spare ignition system, door tops, doors, I've never thrown anything away that i've replaced, so there's all sorts there. I will include some of the specialist Unimog sized tools that you need for certain jobs too. It has recently had a new civilian distributor cap and leads/plugs installed, this had improved the driving experience even further. this was not a cheap item, and I did wince at the cost, but it was worth it. If you wonder what the runnign costs are, I can say that it does about 12MPG but less if you are driving high speeds on the motorway, the LPG tanks both cost about £30 to fill up each - never more than that. - you should get a few hundred miles on that. If your local to Romsey I guess I could deliver - once payment is secured, or if you are any further I would stick it on a low loader. Not because it wouldn't make it, but spending hours in the Unimog cab on motorways is noisy and expensive - a low loader would be easier on the ears and cheaper per mile.,- especially if its your first time Unimog ownership. I've used it to drive to my brothers place near Portsmouth on a round trip done two or three times in one day, with about a ton in each time, and it was fine. It needs to be filled up at an LPG pump only. I'm lucky I have one within a mile or so. It also has a FLT hose connector if you want to run it off fork lift bottles instead. I should state that i would take cash on collection or bank transfer only. If you want to do a cheque it needs to clear before collection. could do with that when I park up at the supermarket, you won't get may wanting to park right up close to you with that. Good luck selling, it's not for me. It will be the single best purchase of your life, so go ahead make my day. 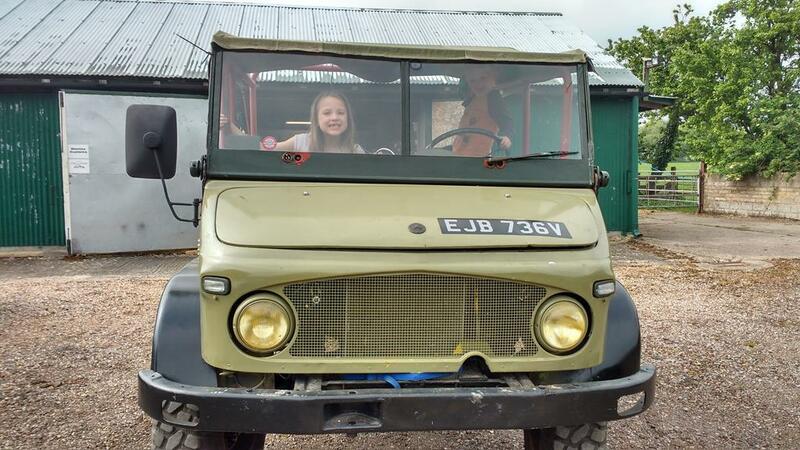 So it turns out my Unimog has many admirers but very few ( none) potential buyers. therefore it needs a jolly good bump up. Did I tell you that it is properly awesome, - like way more awsome than an awsome thing on an awsome stick. I measured it the other day, and it turns out its not big. Its 4.85m long, 1.9m wide and about '.........' that tall. - Its smaller than the new discovery!! - and more reliable too, and better built, and lower servicing costs, and you would look awsome in this. It now has posh insulation and carpeting in the front of the cab too, so its practically an offroad S class really. Its got a mega PTO winch on it. err, I'm running out of excuses now. Or arch to arch looks more realistic. Whats the details on the V5 for it? It's got a 1980 numberplate, but is MOT/tax exempt? I'm a little confused. Hi everyone. Sorry I’ve been absent from the forum. It sold and went to a new home in Cornwall. To answer the above questions. It is/was 2100mm at the widest point. It’s 1959 model (first built) served in the military and discharged in 1980. When it was first registered in the UK. There were about a dozen registered at the same time when you check the number plates either side of mine. PS I’m quite sad that it’s gone, but I have a replacement already.